Submitted by Pierre on Fri, 10/23/2009 - 17:17. "African Americans are notoriously intolerant of other minorities." Actually, this statement is plain wrong. Blacks are very welcoming to other minorities. I'm not sure if you are calling 'homosexuals' a 'minority'. I am black, and grew up in the inner city, went to college, and live around midclass Americans (point being, I have been around all kinds of african americans--ghetto to snobbish). I have never (that I can recall) heard a black express dissatisfaction of the growing hispanic or asian population. So, I am not sure where you are getting this from--comedians maybe. Oh, to be fair, some do complain about Asians owning liquor stores, beauty supplies, and swapmeets, and some complain about Indians, but thats about the extent of it. We typically get along with other minorities as long as they are not rude to us, from my experience. (I am making this point becuase this seems to be a common misconception about black people. I have no idea where this comes from.) If I am wrong, I stand corrected...but I would need to see something that proves this statement. Now the previous post was correct about intolerance of gay marriage. This has more validity. If you are calling gays a monority then this may be a good point. Submitted by VenturaHighway on Wed, 10/28/2009 - 15:43. Yep, gays are definately a minority, with their own unique contributions to the vibe of a city. Submitted by gpurcell on Fri, 10/23/2009 - 09:41. "For example, how can a city define itself as diverse or progressive while lacking in African Americans, the traditional sine qua non of diversity, and often in immigrants as well?" I'm sorry but this is just a nonsense. Diverse, if it means anything, means reflecting the background of society. 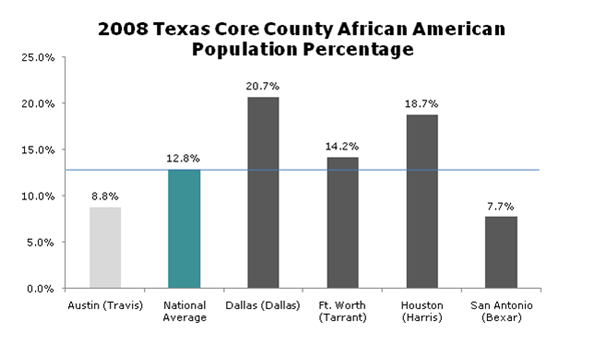 It is no crime against diversity or progressivism to have a Black population that is at or near their national share of population--particularly when, as in the case of Austin, any deficit is more than made up with Hispanics and Asians at levels above the national average! Submitted by lisa96 on Thu, 10/22/2009 - 19:56. I don't know any of the white cities you list but I do know Indianapolis and Detroit. I don't believe any of those white cities ever had a substantial African American population and were therefore never subjected to the racial tensions, violence and crime that cities like Indianapolis and Detroit had. The rings of suburbs around Detroit and Indianapolis didn't appear simply because of white racism alone. Urban decay was not the result of white racism alone. The steep decrease of property values in these cities was not due to white racism alone. Portland, Austin and the other white cities never experienced that tension, their downtown's never suffered that decay so property values in the cities never collapsed like they did in Indy and Detroit so they were able to invest in the kind of infrastructure to appeal to progressive, educated folks. It's facile to blame white racism on every discrepancy between whites and blacks but it doens't make it accurate. Submitted by Somnio on Thu, 10/22/2009 - 22:13. Less than 50% of Austin's population is "White". I guess in the author's mind less black equals more white? This data is from the 2008 U.S. Census Bureau estimates. Submitted by lisa96 on Fri, 10/23/2009 - 10:46.
and we spend a lot of (wasted*) time talking about the achievement gap between whites and students of color. Our Asian population, which is larger than our African American population, is considered white for the purposes of these exercises since they are as successful or more successful in average than the white population. That pisses of our Asian teachers to no end. wasted* - I say wasted as no improvement has come from these exercises, not even a suggestion for improvement. African American does not EQUAL Minority! Submitted by Myneca on Fri, 10/23/2009 - 10:34. Being an African American who lived in Austin over 20 years, I am fully aware of amazing diversity that the city offers....minus the Black population. 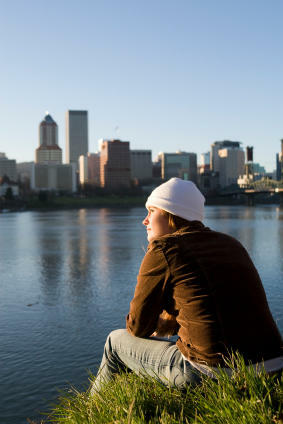 Theses cities do provide diversity through various cultural groups and the Latino population. I think that we must be very careful to equate the word "minority" with African American as that can emcompass many groups. My personal choice was to leave Austin to live in Baltimore, a city with a 65% Black population, which I find not to be nearly as diverse as you may think. There are small sprinkles of Italians and Jews but rarely do you see the groups interacting together nor beyond experiencing African American culture do I get a glimpse of additional cultural outlets. I miss the dynamics that Austin presented....but my give and take is the tremendous opportunity to learn more about my African American culture through living in this city. Submitted by mbader on Thu, 10/22/2009 - 19:11. Mr. Renn, this is a thought-provoking post about a very important topic. Unfortunately, like other commenters, I must take issue with your conclusions based on your data. I have written a response to the main points on my blog. Basically, I find two problems: first, only looking at percentage African American misses a huge amount of diversity in the population and second, the mere presence of African Americans does not mean that they are integrated. In fact, many of the metropolitan areas that you hold up in comparison are much more segregated than the "model progressive" cities you discuss here. 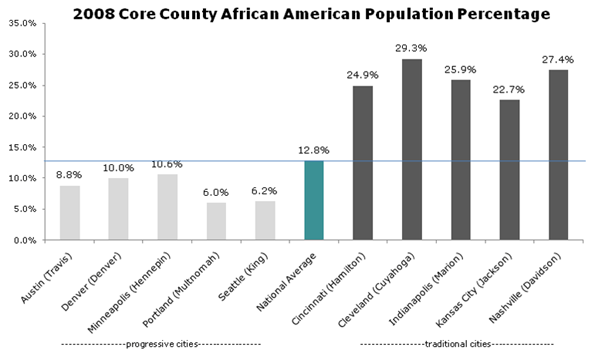 As a side note, in response to one of your comments above, I used central-city numbers to look at racial composition and find very different results than you do using central county figures. I maintain that counties are not any more systematically similar than corporate limits of cities and, given that your interest is in policies, most of those are enacted at the city -- not county -- level (with notable exceptions like Indianapolis and Louisville). Submitted by sobelone on Thu, 10/22/2009 - 17:40. What about Asians? I know for s fact that Seattle has an Asian population of about 15%. 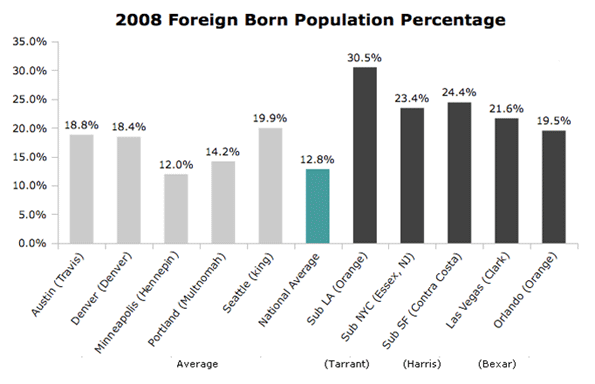 Minneapolis, Portland and Austin also have higher than average percentages of Asians. PS I have never known Denver to be a particularly progressive city. PPS What about San Francisco?!?! San Francisco is only 45% white. It is 33% Asian and 15% Latino. Submitted by Chriswescott on Thu, 10/22/2009 - 12:52. "This history and resulting political dynamic could not be more different from what happened in Portland and its “progressive” brethren. These cities have never been black, and may never be predominately Latino. Perhaps they cannot be blamed for this but they certainly should not be self-congratulatory about it or feel superior about the urban policies a lack of diversity has enabled.?" Why not? I could not disagree with you more on your under challenged, fully expected, half backed mushy liberal stance. If these progressive cities have a formula for success, and that formula is that a larger proportion of the population can collaborate with one another to reach more consensus based solutions than even that should be celebrated. My point isn’t that they are more of the same national heritage and ancestry. I am making the point that in these cities there is a higher than normal level of social contract and conscientiousness. If that is in fact the case then we should celebrate that. I live in NYC. It is a mess of conflict and rudeness. People literally will walk right into you to prove to you that they aren’t budging for anyone. I don’t care if you are African or Danish American, what is wrong with a little social courtesy? Is it because NYC is so multicultural that it is a quagmire? Yes but that’s a smaller point than that of our nation having no idea how to manage multi cultural populations. How do we set expectations of one another as residents and hold each other accountable for acting in a way that fosters social harmony. Maybe we are too scared to be branded with the scarlet letter of today…the big R for Racist for expecting African American to defer the right of way from time to time when walking on the sidewalk as it were. Or to not drop their McDonalds bags on the street when they decide they are done with their meal and we pass by silently knowing there is no consequence and no feedback given. We are too scared of being labeled to create a new more racially inclusive version of a collaborative community that lives by a consensus based social contract. This Fear of being branded Racist will continue to diminish quality of life in multi-cultural cities and will force us to continue hitting the glass ceiling of race relations progress. Let us not celebrate NYC because it has a high percent of minorities and blast Portland because the city is great and it works. That is backward logic and it makes no sense unless you are blind to the facts and fully brainwashed.